Barreto Hydraulic drive micro trencher model 712MTH has a unique automatic wheel drive system to adjust the wheel speed to the load on the digging chain. This make it easy to operate even for a novice user. One control lever to operate the wheel drive, One to operate the chain drive, just engage the wheel drive lever and let the trencher do the work. 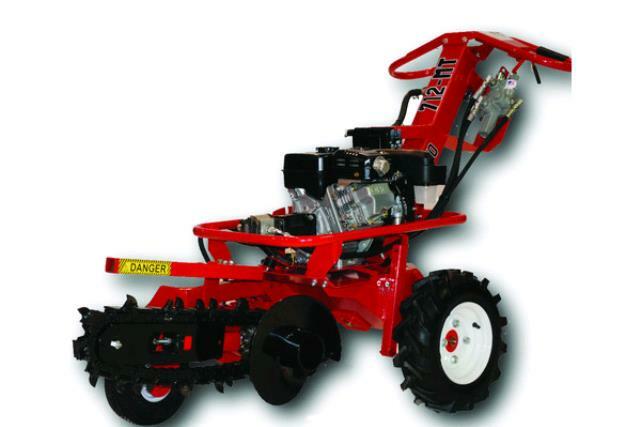 18" TRENCH DEPTH MAX @ 4"
WEIGHT: 400 LBS 43"h 30.5" W Wheel Base 25.25"
* Please call us for any questions on our trencher 4 inch x18 inch barreto 712mth rentals in Portland OR, Gresham OR, Milwaukee OR, and surrounding metro area.